Are you thinking about adding a pool or spa to your outdoor environment? If so, look no further than connecting with our aquatic design professionals who can impart a wealth of knowledge, ideas and inspiration working with you in designing and implementing that perfect pool or spa as a focal point to your outdoors. 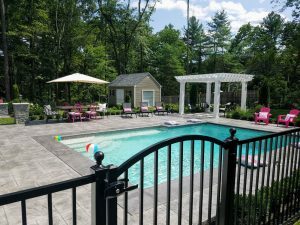 IVY Studio is an aquatic design and build firm based in the metro Boston area that has redefined traditional pool and spa design and build methodology. Our three- stepping stone process encompasses planning, designing and implementing with professional project management oversite. Building a swimming pool is so much more than digging a hole and filling it with water. Swimming pools and spas are a focal point for warm weather recreation and provide refreshing relief from the hot summer sun. A gathering place for friends and Family, for multi generations and those who are drawn by the social life that arises poolside. Contact us at 781-591-0300 or vern@ivystudioMA.com to learn more about how we can work with you on your upcoming aquatic project.